The question of Palestine has been a pivotal one for international law ever since the foundation of the United Nations Organisation in 1945. It remains so today. On 9 July 2004, the International Court of Justice gave its advisory opinion on the Legal Consequences of the Construction of a Wall in Occupied Palestinian Territory, where it ruled on some major international law questions concerning the applicability of the Geneva Civilians Convention of 1949 to prolonged occupations, as well as human rights law more generally. It confirmed the illegality of the Israeli civilian settlements established on occupied Palestinian territory and affirmed the continuing relevancy of the right of the Palestinian people to selfdetermination, which it considered an obligation erga omnes. The ICJ did not, however, rule on many of the international law questions pertaining to Final Status Issues which still need to be negotiated between the Israeli and Palestinian leadership if peace is to ever be accomplished in the Holy Land. In this series of essays, with contributions from Michael Akehurst, Jean Allain, Pieter HF Bekker, Orna Ben-Naftali, Francis Boyle, Antonio Cassese, James Crawford, Omar M Dajani, Jamal L El-Hindi, Aeyal M Gross, Ardi Imseis, Michael Lynk, John McHugo, Keren Michaeli, Roger O'Keefe, John B Quigley, Martha Roadstrum Moffett, Adam Roberts, Iain Scobbie, Samira Shah and Lex Takkenberg, some of the most important questions relating to the Israel-Palestine conflict are addressed and reproduced in one complete volume to coincide with the 60th anniversary of the creation of Israel and the demise of the British mandate of Palestine. 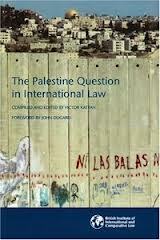 "The Palestine Question in International Law"